Peter Thomas Roth’s passion for skin care is derived from his quest to find effective products to treat his own personal skin care concerns. Initially his primary issue was acne and as time went on anti-aging issues as well. His interests eventually grew into a desire to find the best tools to combat acne, the many signs of aging, as well as protecting the skin from sun damage. As the first generation child of Hungarian parents, and a frequent visitor to Hungary, skin care is an inherent part of Peter's heritage. Nearly 100 years ago, Peter's family owned and operated two spa resorts in Hungary. When Peter launched his company in 1993, he started with the basic soothing and healing philosophies of the many muds and minerals found in the thermal springs that Hungary is famous for. Peter blends the old Hungarian philosophies with 21st century skin care technologies and ingredients to create effective skin care that does what it promises to do! Because of Skin Care Awareness Month, we are still focusing on summer skin care products that protect you from the harmful rays of the sun. "The rays of the sun have more potential to change the look of your skin than any other environmental factor. Sunburn or even a tan indicates your skin has been damaged, and sun damage causes your skin to age before it's time. Ultraviolet light from the sun breaks down collagen and elastin, the building blocks of your skin, causing wrinkling and sagging. The sun's rays also make skin rough and can over stimulate pigment cells, causing brown spots. Our cutting-edge sun care products provide broad-spectrum UVA/UVB protection." Brush-on sunscreen! A talc-free, transparent matte, SPF 30 mineral powder in a convenient brush applicator for instant sun protection anytime. Mica, a transparent mineral, reflects light creating the illusion of smoothness and radiance. Iron Oxides, natural salts that give the powder its neutral, transparent appearance. Vitamins A, C & E, anti-oxidants, protect against free radicals. Willow Bark Extract, a natural source of salicylic acid which enhances cell turn-over helping to improve the appearance of photo-aged skin. Corn Starch helps absorb oil. I love the idea of a brush on sunscreen. It's like a finishing powder for you face, so you don't look oily and shiny like most sunscreens appear to do. This instead gives your face a nice finished appearance while protecting you from the skin's harmful rays. I am in love with this sunscreen, and I think this is the beginning of a new ground breaking trend in sunscreens. For those of you that prefer a quick easy spray on sunscreen, this would be a better choice. 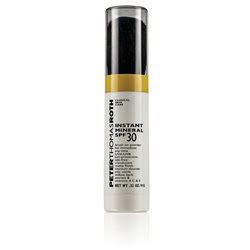 The Continuous Sunscreen Mist SPF 30 ($28) is an easy to use, convenient, oil-free continuous mist with SPF 30 and anti-oxidant vitamin E. One-touch spray works at any angle without clogging – even upside down. Protect skin from harmful UVA/UVB rays and environmental damage. Easy to apply spray mist allows for quick and even coverage on those hard to reach areas such as the back of the knees, shoulders and lower back. Lightweight formula absorbs quickly and has a fresh scent. Easy and lightweight for on the go, in the sun, summer fun this sun screen has a nice smell, and it doesn't stink like other sunscreens. Perfect for a day on the beach, or maybe just a day anywhere outside on the go, this can be sprayed on before you leave, or anytime during the day. These summer products along with other skin care is available at the Peter Thomas Roth website. I received product for the purpose of this review only. No monetary compensation was exchanged. All opinions are my own.